Operating an efficient plant is challenged by asset reliability, labor, and increasing material and energy costs that will affect production costs. Visibility into the performance and availability of assets, material consumption and schedule adherence helps to address areas of concern when they occur. 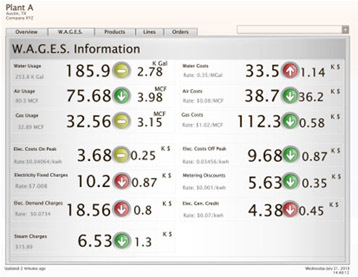 Measuring total energy spend provides the basis for managing total manufacturing energy spend. This type of knowledge supports sustainability efforts and helps reduce manufacturing costs. Production Management - Provides the data context necessary to properly quantify material consumption, energy requirements and schedule adherence. Quality Management - Scrap and rework is reduced when the product is "made right the first time." Material Management - Improves FIFO on raw materials to ensure freshness of ingredients and reduced spoilage. 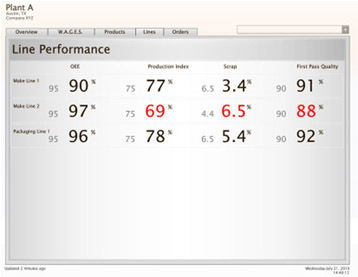 Performance Management -When production equipment runs at the utmost in efficiency, reductions in energy and labor are imminent and maximum throughput is realized. In order to get the most out of fixed and variable production assets, it is necessary to provide a platform for continuous improvement to get the most out of assets consumed in production. The CPG Suite of Applications provides the basis for a cost reduction solution. Investigate further by selecting the links below.